The library contains a wealth of resources for the students and staff of the department, and it is a pleasant place to study. 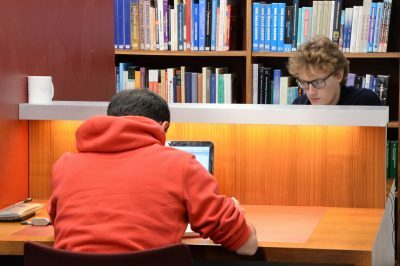 Undergraduates are automatically registered to use the library. Members of the department have 24-hour swipe access. The library is staffed in the morning, Monday-Friday, and on some afternoons (generally not Wednesdays or Fridays). At other times, Reception may be able to help with access to some library material. External readers may be able to use the library – please contact the librarian. The library is situated in the Department of Earth Sciences. The following guidelines are to ensure the library runs smoothly and remains a useful resource for all. Do not eat, or drink anything but bottled water. Use the self-issue machine to borrow books, even when you are taking them to the Labs, your office or the Common Room. Leave desks free for others to use – personal belongings may be left in the slots by the outsize books. Switch the lights off if you are the last person to leave!